Redwood City, CA, October 14, 2015 — Workboard announced new upgrades today to its goal and performance app; the company’s enhanced 1on1 meeting capabilities make it easier than ever for managers to provide real-time feedback and coach employees. As companies shift away from annual performance reviews to regular 1on1s, these enhancements help managers and employees make the most of more frequent performance conversations by including alignment, performance, growth and current work. The Workboard app helps managers and teams align goals, work and feedback in real-time to raise their achievement velocity and satisfaction. Managers use Workboard 1on1s and feedback badges to help employees achieve at their highest level and cultivate a momentum culture. Workboard enhanced its 1on1 capabilities with a simple, but elegant way for managers and employees to share their perspectives on engagement, performance, and alignment (EPA) in addition to discussing work and goal topics. At each meeting, employees and managers use a slider to indicate their assessment in each category. This unique EPA Meter helps both parties visualize gaps and create a clear starting point for more meaningful conversations. By combining operational topics with performance touchpoints, Workboard helps managers be more efficient and more effective in their 1on1s and reduce. 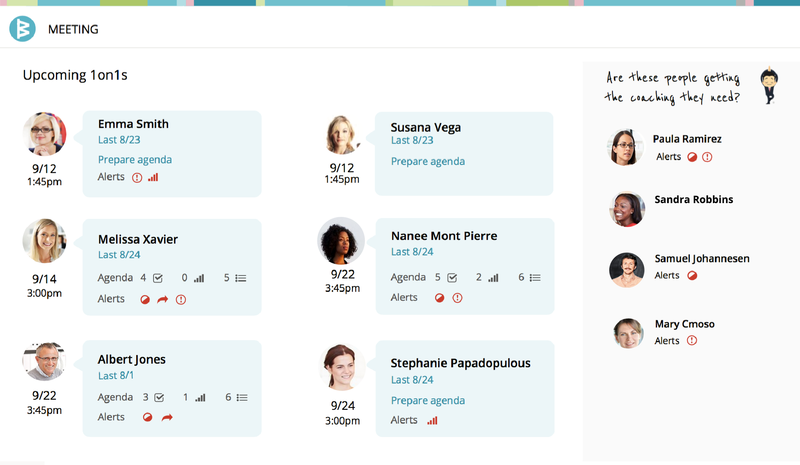 Workboard takes a proactive approach to performance. Its app is designed to help business managers and employees engage in goals and perform at their highest, unlike traditional performance applications intended to assess performance after the fact and which are rarely used by line of business teams. The Workboard app links short term goals to real time execution and consistent feedback, which has a dramatic impact on engagement and achievement velocity. Last quarter alone, the average Workboard customer engaged with their goals 120% more often, gained 135 execution hours, and received peer or manager feedback on their work 5 times per week. This announcement comes as the annual performance review model is on the way out. A mountain of research from academics, business schools, and neuroscientists alike has found annual goal setting and performance reviews are “ineffective at boosting performance, actively alienate employees, are based on a flawed understanding of human motivation, and are often arbitrary and biased.” Only 7% of companies understand the goals of the organization and what to do to achieve them while 72% say their performance would improve with more specific and constructive feedback, which represents enormous untapped potential. By bringing goals, work and feedback together in an easy app, Workboard is a pioneer in helping organizations enable and accelerate performance rather than simply assess it after the fact. Workboard also announced a new integration with Slack today, which further demonstrates its dedication to continuous conversation on goals and team achievement. Slack currently has over 11 million daily active users with 10,000 teams now using Workboard. User comments on goals and work in Workboard appear in Slack real time; actionable conversations and decisions in Slack can be turned into immediate actions in Workboard. Workboard users can also add their team directly from Slack to simplify onboarding and accelerate team achievement. For more information, visit www.workboard.com. Workboard Inc. provides a holistic approach to high performance. Its next-generation performance solutions allow HR leaders to help organizations raise their achievement velocity and helps line of business managers share engaging short-range goals, align and simplify execution, and elevate people and performance with continuous performance conversations. With its web and mobile solution, Workboard makes work easier and more meaningful for front line managers and employees at more than 10,000 organizations including large pharmaceutical, financial, technology, oil and manufacturing companies. For more information, visit www.workboard.com. Workboard's enhanced 1on1 meeting capabilities make it easier than ever for managers to provide real-time feedback and coach employees.